From The Golden Age Site. Another beautiful classic from the Golden Age of Illustration. They don’t call it the Golden Age for nothing. 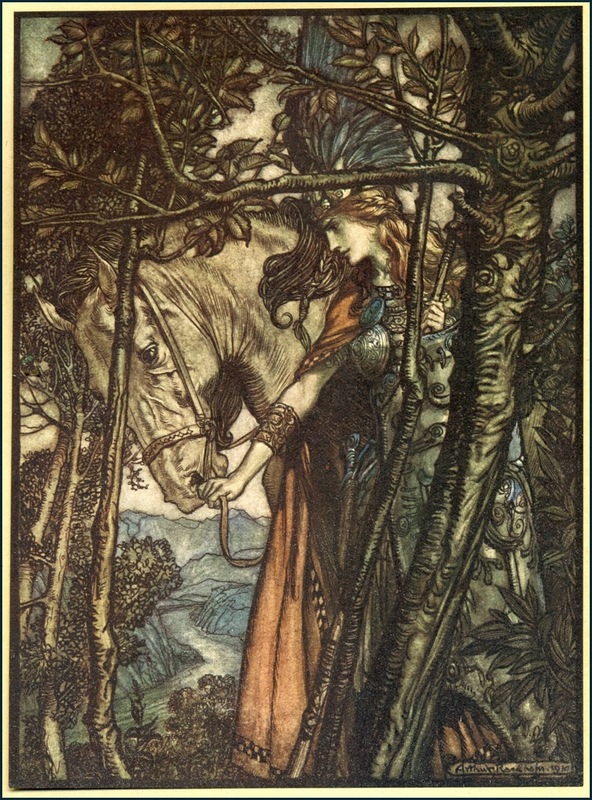 For more, see my previous posts on Arthur Rackham, and here and here. Beautiful line work but I do feel the figure gets lost because the composition is so busy. It took me a few second even to realize there was a head in there. Unfortunately, the reproduction here is not as clear as it would be in print. It’s not the drawing, painting or composition that is at fault; it’s the low-resolution reproduction based on a scan from a book page. If you look at the article from which this is taken, you will see more illustrations that may give you a better idea of how this should look. I just happen to love this particular illustration. He influenced so many artists and illustrators. Just great. Perhaps it should be noted that this was a particular approach used by Rackham in a number of pieces, a strategy that, consciously or not, might well have been conceived as a sort of stained-glass kind of composition. Dark lines define and contain everything, the lines heaviest where they function as figural and compositional outlines. His ink line and color fill technique, along with his striking style, made him a distinct influence on a number of British comic book artists in the 1960s and 70s, notably Barry Winsor-Smith and Jeffrey Catherine Jones. I’m not into frightening mythology, therefore I prefer his ‘ Alice in Wonderland’ etc., and as you stated in the AR update on June 29, 2012, the Valkyrie are too “dramatic and powerful” to me. They always have been. In other writings he’s considered a rogue illustrator. Wonder why.